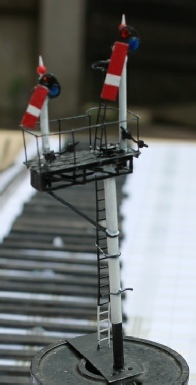 Thes 3 photos show a 4mm scale GWR tubular bracket signal under construction. Methods are pretty much as case study 1, but here no working lights or servo motors were required. First photo shows main structure in primer, second - complete except for operating wires. There are lots more photos of this signal to be seen on the RMweb layout thread ‘a nod to Brent’. The signal is based on the 1943 branch home bracket signal, which was installed at that time because of the revised track layout. 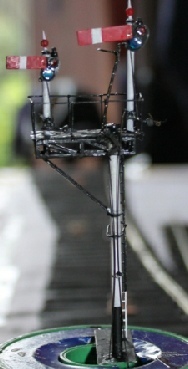 The bracket had to be modified to suit the prototype post (doll) layout, which differs from case study 1.